Teachers should click on the Case Study link in upper right to see how the Climate Wizard is being used by other organizations. Tool could be used in a social science class as well to explore how impacts of climate change could affect the economy. Website allows users to view historic temperature and rainfall maps for all land surfaces (except Antarctica), view state-of-the-art future predictions of temperature and rainfall for the same areas, and view and download climate change maps for these areas in a few easy steps. Base climate projections are downscaled. Comments from expert scientist: There's an impressive amount of good data presented in a user-friendly way. The choices of analysis areas are also good as users will primarily be interested in the U.S. and the globe. With the appropriate educated guide this site could teach people interested in climate a huge amount. 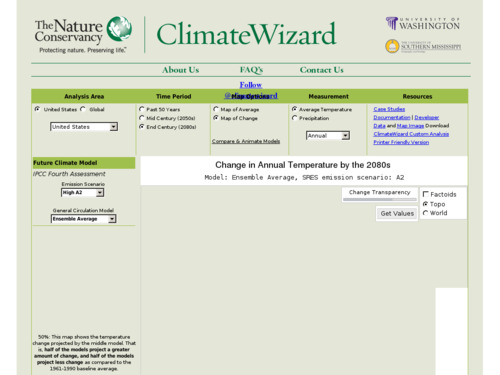 The FAQ link in the top menu answers many questions that educators and students might have about how to use the climate wizard and background information on content and data. Students can visualize local impacts. It takes time to familiarize oneself with all of the elements of this interactive. High resolution and colors are engaging.